This week, besides my half-marathon training, I had three races that I would participate in: The 9/11 Run for Our Troops 5k, the South Carolina Tunnel to Towers 5k, and the Splash and Dash Adventure Race. But, apparently Mother Nature had other plans. However, Hurricane Florence will make its initial impact on the Carolina coast late Friday. I started to wonder how training would go on Friday when the internet, social media in particular, became abuzz with word that Hurricane Florence was coming this way. Monday was the start of things getting serious though, when I got two emails from the CWC Jaycees. 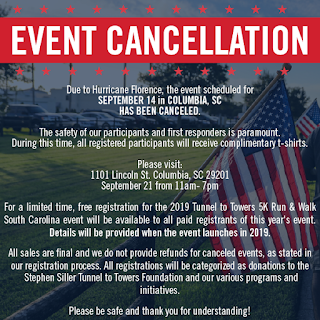 The first email from the Cayce West Columbia Junior Chamber said that they would monitor the news and that the South Carolina governor, Henry McMaster, had issued a mandatory coastal evacuation order for 11 September, the day of the 9/11 Run for Our Troops 5k. The CWC Jaycees sent out their second email just a few hours later stating that the race event was postponed and they would send word on the future date for the race. The next day, I got an email from the Run For Our Troops stating that the race was rescheduled from September 11th to November 11th, Veteran’s Day. With the Tuesday race postponed until later, the next word I got concerned the Splash and Dash Adventure Race. I was looking forward to this one because it was not a typical type of race that I do. I usually run in 5k to 15k races, or participate in the occasional duathlon (run-bike-run). The Splash and Dash Adventure Race had us set up as a team of two, run two miles together, bike four miles together (on separate bicycles if you are asking), and kayak one mile. The Splash and Dash organizers were the first ones to initially send an email out regarding the weather and warning people that they would be watching the weather. So, a little before noon on 11 September, they sent an email out stating that the Splash and Dash race was cancelled. Based off of the weather models that I’ve seen online, the Saturday race would be in consistent rain throughout the entire race, and considering there is a kayaking portion on the river, it’s good that this one is cancelled. The Splash and Dash probably would have used the least amount of resources from the county and city in terms of police and paramedics, but it’s still a good call. 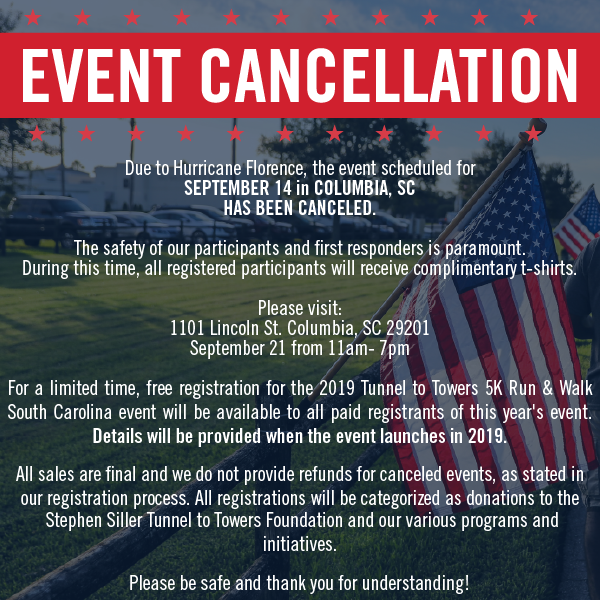 The final race event to send out information on their event was the Stephen Siller Tunnel to Towers 5k in South Carolina. I got the email on Wednesday, 12 September, at 2:30 PM and my wife send me social media posts stating that the race originally scheduled for 14 September was cancelled and that while no refunds would be issued, we could still get our shirts on 21 September and there would be a limited amount of time for free registration for those who signed up for this year’s race. That limited time would be announced later in 2019. This week was building up to be a pretty busy time for me with three races and the need for a long endurance run, but with Hurricane Florence barreling down from the Atlantic, plans can be wiped out in a short amount of time. I was really looking forward to participating in two races I haven’t done before and running amongst the crowd with the Tunnel to Towers race, a race I truly love being in while supporting a great cause.